Jerusalem (2nd from right) and Landero (3rd from right) at Friday's weighin. CEBU - Two former world title challengers will fight to keep their careers alive this Saturday at the Minglanilla Sports Complex in Minglanilla, Cebu. Melvin Jerusalem (13-2,8KO’s), who lost in his bid to dethrone WBC minimumweight champion Chayaphon Moonsri of Thailand last year will face Toto Landero (10-3-2,2KO’s), who lost twice this year in challenging WBA world minimumweight champ Thamanoon Niyomtrong of Thailand and IBO world titleholder Simphiwe Khonco of South Africa. 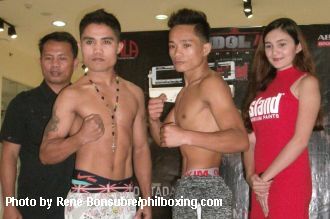 During the official weigh-in held at the STAR Mall, Jerusalem weighed in at 105.5lbs while Landero was at 106lbs. This will be a non-title contest set for ten rounds. This will be Landero’s first fight since those back to back title losses. Jerusalem, who fights out of the ALA gym, had an 8th round TKO win against Philip Luis Cuerdo in Maasin City last June. Cuerdo also fought Landero twice, and came up with a draw and split decision loss three years ago. It is also interesting to note that both boxers lost to Joey Canoy of the Flores Boxing Gym of Mandaue City. Last year, Landero upset Vic Saludar by split decision in Mandaue City. Saludar would go on and win the WBO world minimumweight title last July by unanimous decision against Japanese Ryuya Yamanaka in Kobe, Japan. The undercards will feature two undefeated ALA prospects Esneth Domingo (10-0,6KO’s) and Christian Bacolod (9-0,7KO’s). Esneth Domingo (2nd from right) and Reymark Taday. Domingo will be pitted against Reymark Taday while Bacolod battles Christoval Furog. Both Taday and Domingo stepped on the scales at 110lbs. They are set for ten rounds. Bacolod was at 107 lbs while Furog was two pounds heavier. They are scheduled for eight. Christian Bacolod (R) and Cristoval Furog. For the rest of the card- Joyjoy Formentera will fight late substitute Crison Omayao. 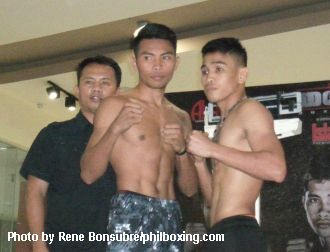 Formentera was on weight at 115lbs while Omayao was at 126lbs and will be wearing much heavier gloves. There will be two four rounders - Danny Villafuerte (116lbs) vs Mark Jun Bato (113lbs) and Jemuel Azucenas (108lbs) vs Kervent Aresco (107lbs). The official weigh-in was supervised by Rolando Mendoza and Glenn Agena of GAB-Cebu.